Who Can Register a Work with the U.S. Copyright Office? Can foreigners register their works in the United States? Can a minor claim copyright? Minors may claim copyright, and the Copyright Office issues registrations to minors, but state laws may regulate the business dealings involving copyrights owned by minors. For information on relevant state laws, consult an attorney. Can I register a diary I found in my grandmother’s attic? Can I see my copyright registration records? Yes. The Copyright Office is required by law to maintain records of copyright registrations and to make them available for public inspection. Once a registration is completed and a claim has been cataloged, it becomes part of the public record. Individuals have always been able to come to the Copyright Office to inspect its public records. Individuals may also request copies of registration records from the Copyright Office’s Records Research and Certification Section. Information from registration records dating from January 1, 1978, is available on the Copyright Office’s website. Will my registration records help provide contact information for someone interested in using my work? Records of copyright registrations and documents that are recorded in relationship to them can be used by the public to identify the author(s) and copyright owner(s) of a work. The public record may also provide information about an agent of the owner who can be contacted to license the registered work or to request permission to use it. Can I remove information that I don’t want publicized? Generally, no. When you register a claim to copyright in a work with the Copyright Office, you create a public record of your claim to copyright. 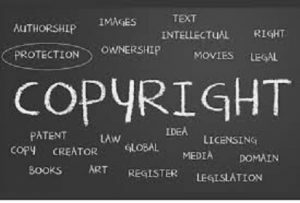 Some information you provide on your copyright registration will be available to the public and on the internet. You may wish to consider whether you want to include a business address or phone number instead of personal contact information, or any other optional detail you consider to be sensitive on your application. Under certain circumstances, authors and claimants, or their authorized representatives, may request the replacement or removal of certain personally identifiable information that is requested by the Office and collected on a registration application, such as a home addresses or personal phone numbers, from the Office’s internet-accessible public catalog, though such information will be retained in the Office’s offline records as required by law. Extraneous personally identifiable information, such as driver’s license numbers, social security numbers, banking information, and credit card information, will be removed on the Office’s own volition or upon request by authors, claimants, or their authorized representatives. 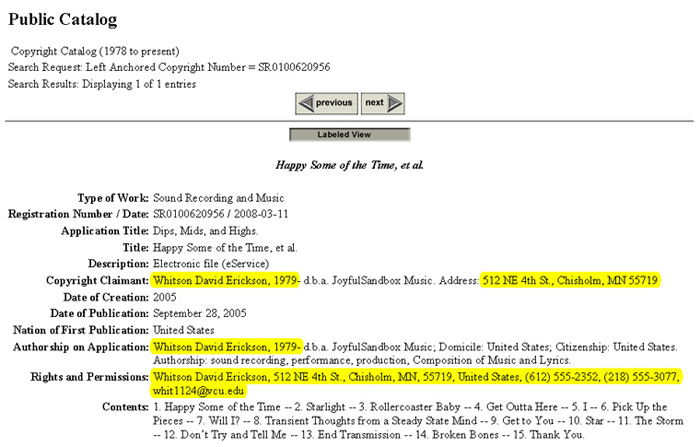 The sample catalog records below show the information from copyright applications that is typically displayed in the Copyright Office online database. Highlighting is added to show certain personal information that may appear in the record. How can I prevent personal information from being placed on the Copyright Office’s website? Certain information that must be provided on the application for registration will become a permanent part of the public record of the Copyright Office, and some elements in the public record will be available online through the Office’s website, including the name and address of the copyright claimant. Any information provided in the rights and permissions section of the application will also be made available online, but providing rights and permissions information is optional. Applicants who want to include rights and permissions information but do not want to provide personal details can use third-party agents, post office boxes, or designated email accounts. If someone else submits an application on your behalf, it is still your responsibility to ensure that information that you want to keep out of the public record is omitted. In certain cases, it may be permissible to register a claim in a work either anonymously or pseudonymously (under a fictitious name). 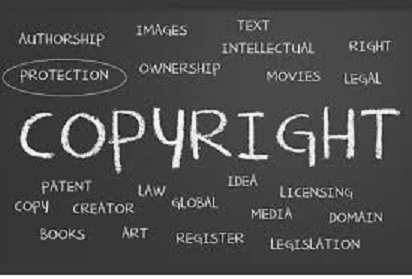 Other categories of information in copyright applications that may be made available online include the following: type of work, registration number, title of the work, author, authorship, preexisting material date of creation, date of publication. 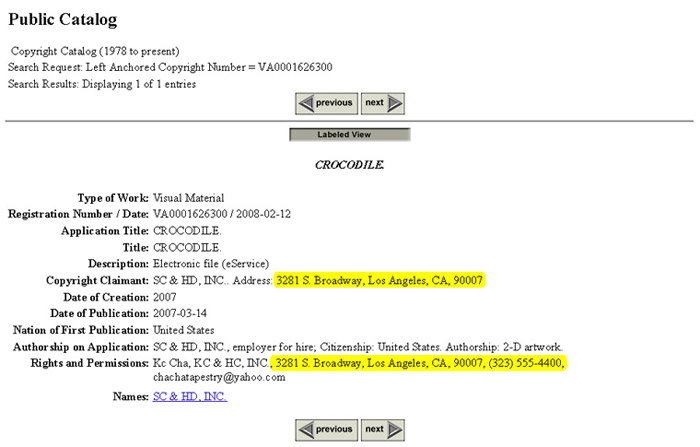 Why is my copyright registration information now appearing on search engines such as Google? Because your copyright registration is a public record, others can access it and may create alternative means to make the information in it more widely available. The Copyright Office is not responsible for the form or the substance of third-party redistribution of Copyright Office records.